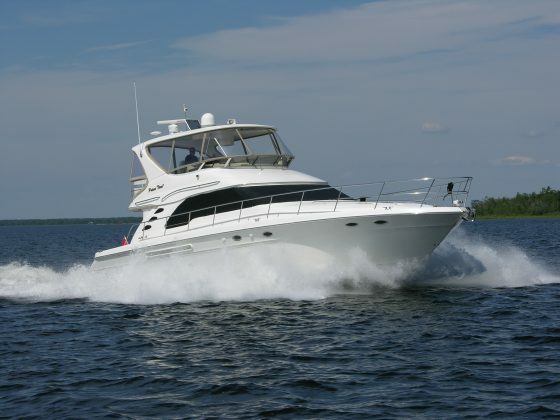 If you’re looking to buy your first boat—first cruising boat that is—or you’ve just got a bit of footitis and are looking to move up in size, selecting and buying the perfect cruiser to fulfill your dreams and budget can be quite the process. The very first step in buying a boat is determining what type and size of boat you want for the boating and cruising you plan to do. Spend time reflecting realistically on your plans, needs and wish list. A thoughtful and focused approach at this initial stage will help narrow down your list of boats for consideration and save you time and money when searching. Don’t forget to include your partner in the search and decision making! How many people will be cruising with you and for how long? This will help you determine the size of boat you need to handle expected crew load and needs. If it’s just two, the size and amenities are quite flexible. 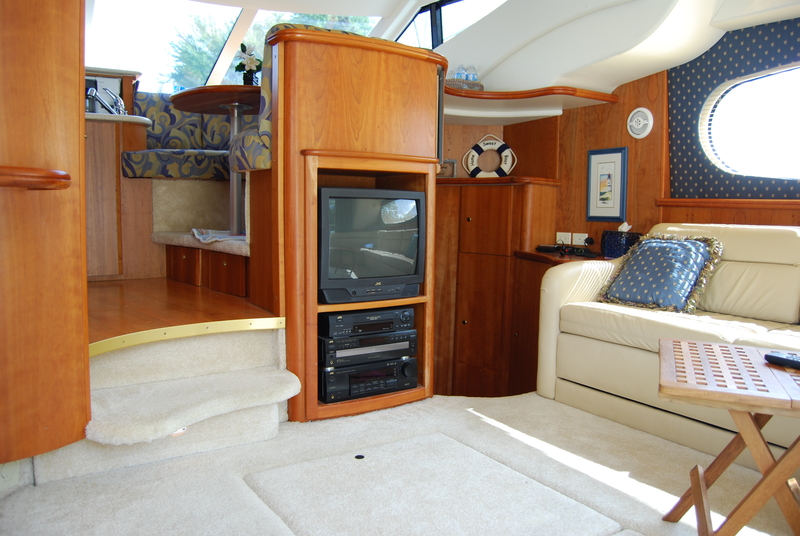 If you are planning to boat with children or other adult guests on board, the needs will change for each situation. Time onboard is also a factor. If your usage pattern is mainly weekends and the occasional one-week vacation, a smaller cruiser works. If you are planning extended trips and longer periods aboard, bigger spaces and privacy can calm the waters. Where do you plan on boating—sheltered waterways like the Trent-Severn Waterway, the Great Lakes or in coastal waters east or west? The bigger the waters, the larger the boat must be. Power comes into play here as well. If you have limited time and need to get to you destination quickly, a planing hull with big power will fit the bill. If the distances are long and you will be putting a lot of hours on each year, consider a diesel powered cruiser or trawler. What amenities and must haves would do you want or need? On the comfort side, these can range from galley size and appliances to number of heads, private cabins, separate shower, entertainment systems, open cockpit, salon seating and dining arrangements. On the systems side, your list may include windlass, various electronics, twin engines, generator and air conditioning. Next is budget (realistically for most this will be first). What can you afford? How much cash can you spend or what is the monthly payment that will work for you? To this, add projected operating costs from slip fees, trailering expenses, fuel, maintenance and insurance. The comfortable numbers you arrive at will dictate the size, age, amenities and options you can afford. Another budgeting factor is based on your mechanical skills and free time. Will you be doing some of the regular maintenance and repairs yourself or will you have your marina do part or all of the work? Not only does this number go into the budget, but it will also be a factor in what age of boat you should look for. Age means more repairs and maintenance—are you up for that? After considering all these elements, you should be able to narrow down the number of boats to look for. 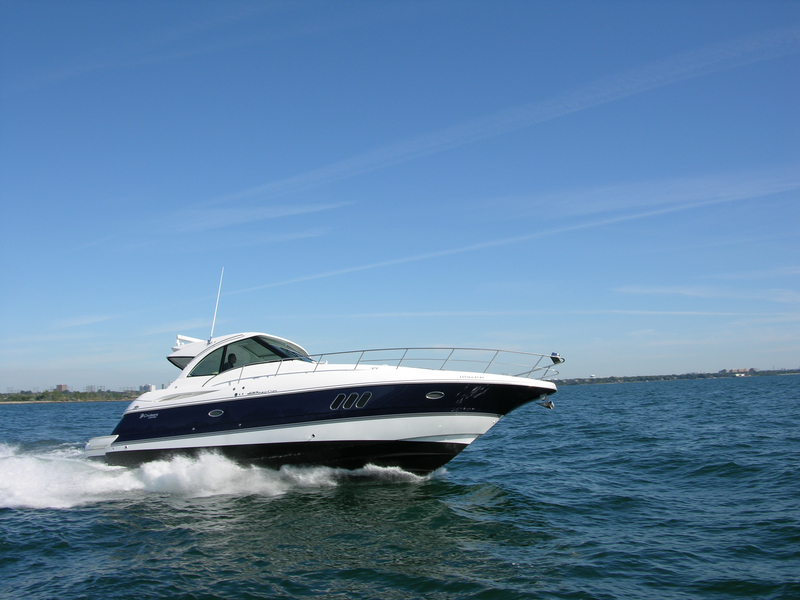 The Internet is a great research tool, so get online and spend time on sites such as BoatBuys.com and BoatTest.ca. You may nail it and zero in on a five-year-old, thirty-foot express cruiser, or be more open to a larger, older flybridge with diesel power. If you can, keep your list down to six to eight boats. The next step is to visit the marinas and dealers. If you are familiar with boats and have the time, you can go it alone searching online, then driving to the boats locations and qualifying the boat yourself. Or, you can select a broker to work with. In purchasing several boats I’ve employed both approaches and can’t recommend strongly enough that you should seek out the expertise of a qualified broker who specializes in used cruisers. Look for ones who are Certified Professional Yacht Brokers. These brokers have signed on to a long list of standards and a code of ethics to become members. Brokers perform many duties beyond just showing you listings. They can conduct local or far reaching searches to locate the boat that lines up with your needs. They also act as a middleman ensuring the transaction is fair to both the buyer and the seller. Most importantly they will take care of the details from arranging showings, on water tests, surveys and mechanical inspections. They also take care of the paperwork including offers, sales agreements and finally the financial transactions. Check out prospective brokers online to start. Speak with boaters in the marinas where they are based to get some input. Finally interview the broker in person or by phone to ensure that you comfortable with them and that they have a clear understanding of you needs, budget and timeline. As for timeline, try to be flexible. Some searches take time. Others happen quickly, so you may have to react fast. 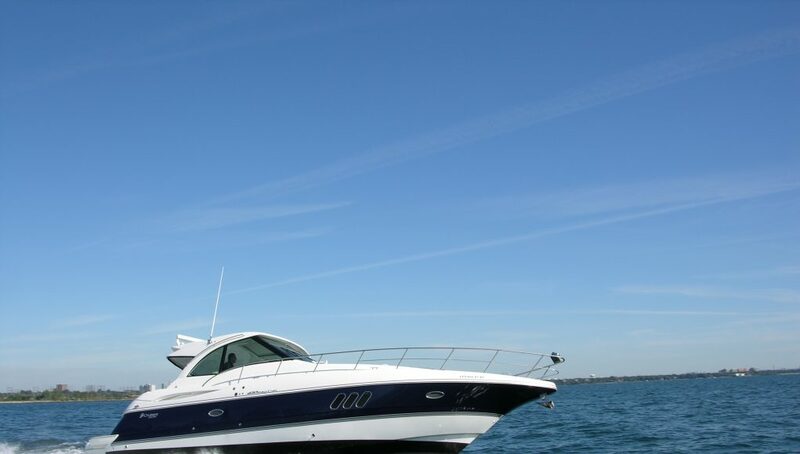 Using a broker to buy a boat is free. The seller pays the commission to both the selling and buying brokers. 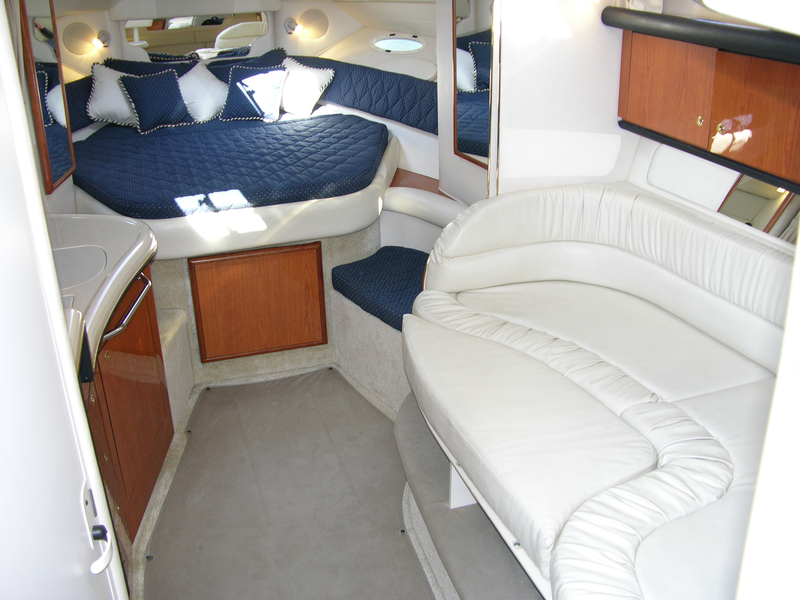 Once you have identified a few prospective boats, it’s time for a tour and a visual inspection. If this is new to you, feel free to bring a knowledgeable boater along. 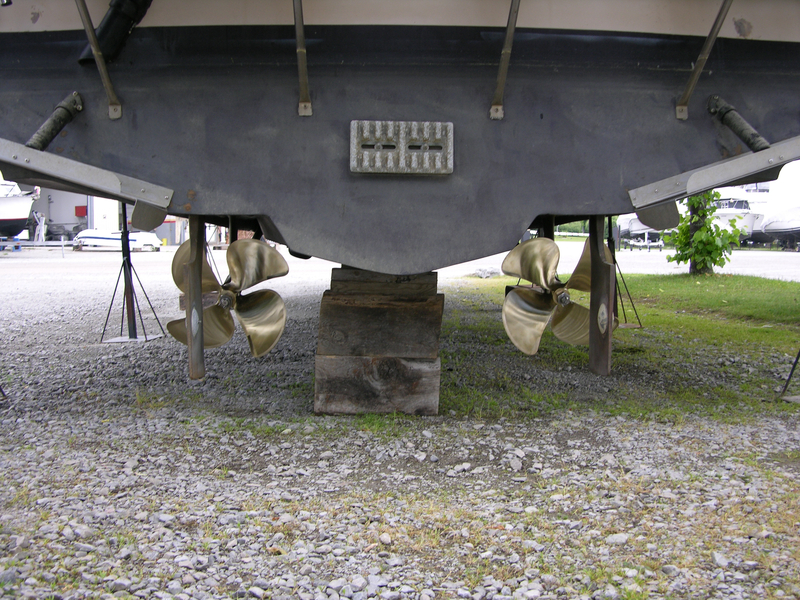 Your goal on the inspections is to look over the boat to see if it has any deficiencies or issues. These may be items needing repair, upgrades or things missing from your must have list. Inspect the boat thoroughly inside and out. Take notes and take pictures. You will be seeing several and they will start to blend together. Inspect the exterior for damage and/or wear to the hull and topsides. 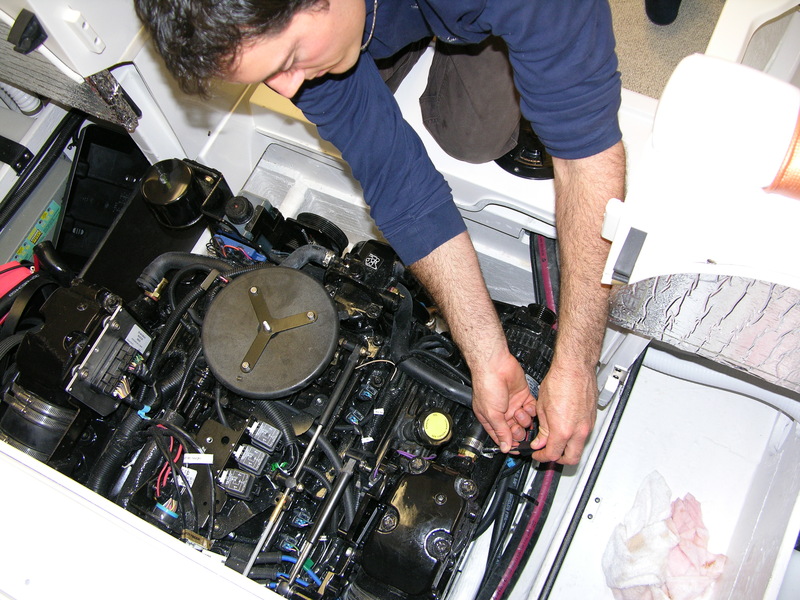 Inspect the hardware for finish, damage and potential water leaks into the structure of the boat. Closely look at all of the boat’s canvas. New tops are expensive. Give the interior the same critical eye. Is everything in good shape, or will you be budgeting for upholstery and other upgrades? If this first review passes the test, take the time to dig deeper. 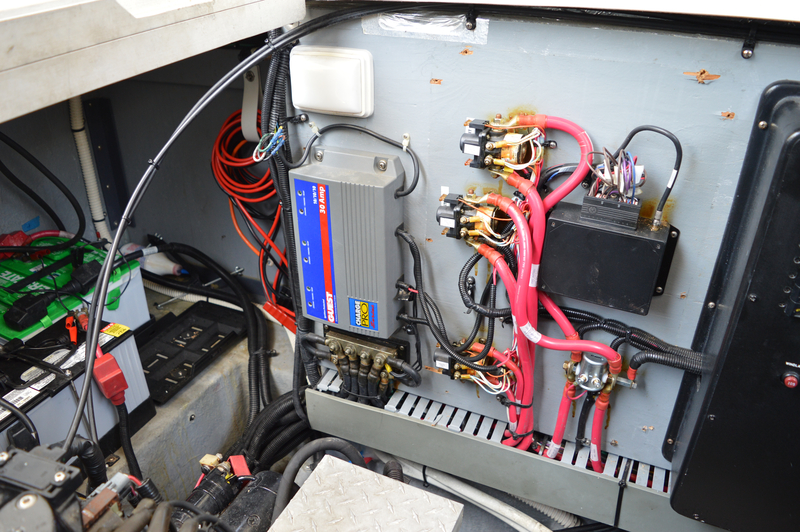 Access the engine compartment and look for fluid leaks, excess water in the bilge and the condition of wiring, hoses, fuel lines and the overall appearance. If things look neglected, they probably are. Work through the boat, looking into every locker and space you can. Test run all of the systems that you can. 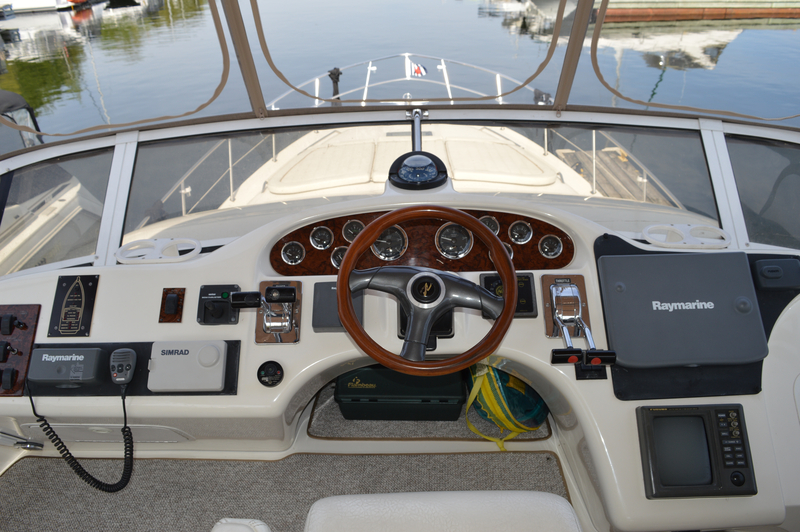 At the helm, note the age and type of electronics and instruments installed. Ask for service records and any history on the boat including damage repair. If all seems reasonable it’s time to move on with the next step. With you broker, prepare and submit an offer. Ensure that all of the details are covered, not unlike making a real estate offer. The proposal should include price, deposit, requests for inclusions, such as removable equipment and conditions. Conditions not to be passed over include a marine survey, mechanical survey and sea trial. If the boat passed all of the conditions, congratulations you now own a new used boat! Your broker will wrap up the financial transactions and paperwork while you prepare to enjoy your first cruise. Stay tuned for parts two and three over the next few issues that will go more in depth into marine surveys, mechanical inspections and what to look for in a sea trial. 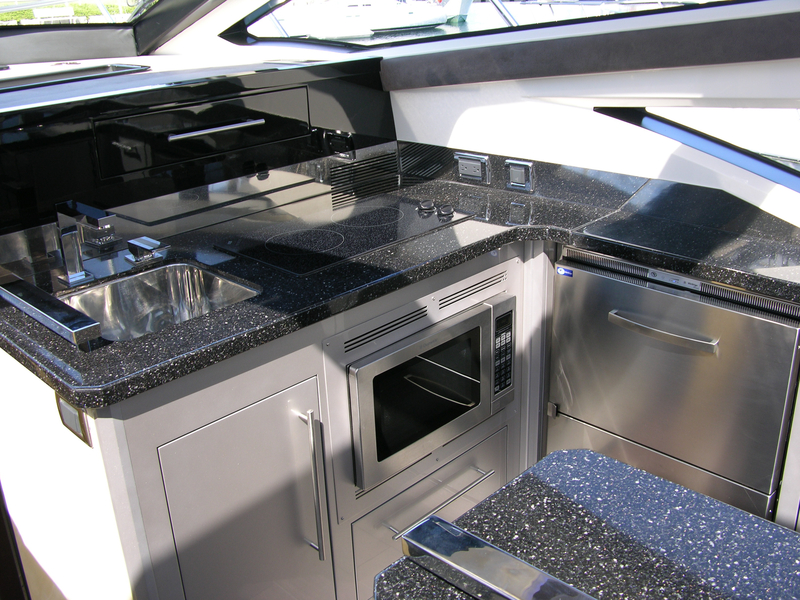 Will this galley meet your needs? 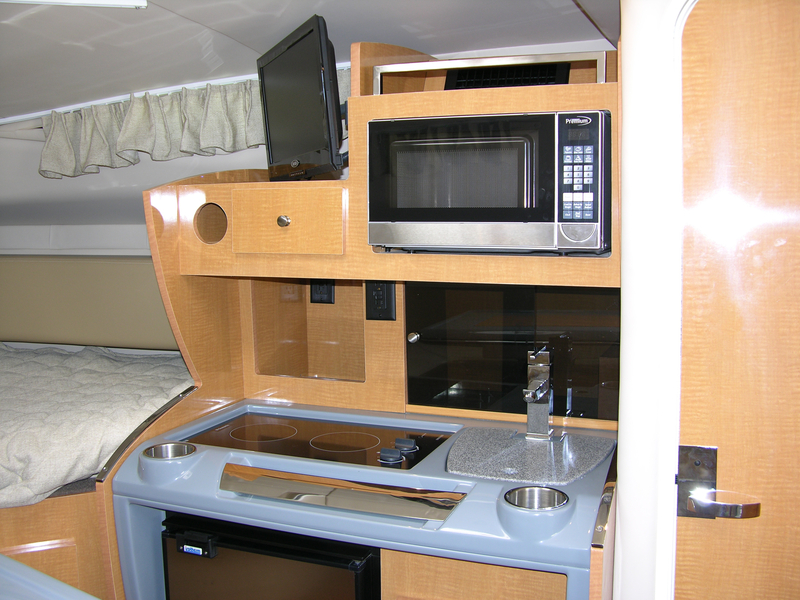 Or do you need a galley for a gourmet chef? This article was featured in the 2017 Spring Issue of Boats&Places.